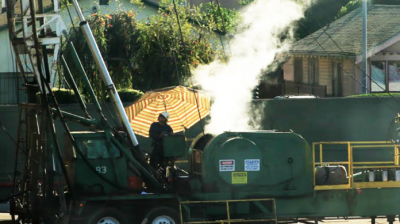 Eleven disadvantaged neighborhoods and communities endure the heaviest use of toxic oil-drilling chemicals in Los Angeles County, according to South Coast Air Quality Management District data analyzed by the Center for Biological Diversity. The 15 zip codes in which oil companies used the most chemicals known to cause serious health problems (“air toxics”) include several areas of Long Beach, South L.A. County and the Westside. In one Long Beach zip code, the oil industry has used almost 50 million pounds of air toxics since 2013. 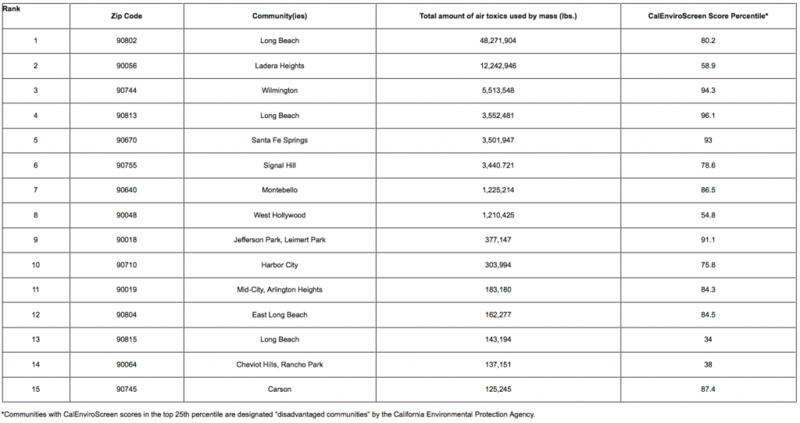 Eleven of the 15 zip codes with the heaviest air toxics use contain neighborhoods like Wilmington that are considered “disadvantaged” by the California Environmental Protection Agency. The agency’s CalEnviroScreen index weighs the percentage of residents who are people of color, poverty levels, asthma rates and other measures of pollution burden and vulnerability. An earlier analysis of air district data revealed that oil companies have used more than 98 million pounds of chemicals known to cause serious health problems in L.A. County since 2013. These air toxics were often used dangerously close to homes, hospitals and schools. Over 80 percent of air toxics usage involved just 12 chemicals, including carcinogens like crystalline silica and formaldehyde. Hydrochloric acid, one of the most frequently used air toxics, is a corrosive gas that can cause suffocation or irreversible lung damage at high concentrations. Today’s analysis underscores the disproportionate harms of California’s oil extraction on vulnerable communities. Gov. Jerry Brown faces growing pressure to confront California’s oil and gas production prior to hosting the Global Climate Action Summit in San Francisco this week. On April 11 a diverse array of environmental, public-health, faith, labor and community groups launched the Brown’s Last Chance campaign to demand that he halt new oil and gas extraction and devise a just transition plan to phase it out entirely. To date more than 800 organizations have signed on. Featured image is from LA West Media.